Xiaomi seems to be on a launching spree as after presenting their beautiful Mi Note 2, they simply showed up with the best thing that could happen in the industry in 2016. The Mi Mix is a smartphone with virtually no bezel on 3 of its sides. If there has been no video telephony or selfies, we could bet the fourth bezel would have even left the space. Mi Mix carries a massive 91.3 percent of screen to body ratio, thanks to its extensive carbon ceramic built and not to forget, this eye catchy design by Philippe Starck. Most users would definitely say that something is missing from this phone or even when Xiaomi used the word concept, many were thinking it to be yet another toy for the experiments. Soon after revealing the 3499 Yuan (INR 34,900 approx) price tag for the phone, the brand surprised everyone with their future centric approach on the everyday smartphones. Whether it would have been Apple on this phone's back, it would have crossed INR 1 lakh for sure. The phone measures 158.8 mm x 81.9 mm x 7.9 mm and weighs 209 grams. The phone uses 6.4 inch, 2040x1080 pixel display with only visible bezel at the bottom for camera and loudspeaker. The conventional earpiece gets replaced by cantilever piezoelectric ceramic acoustic system while the proximity sensor being replaced with ultrasonic sensor behind the display. By these two the screen would actually help you to listen to the phone calls and even adjust itself on various occasions. It is powered by 2.35 GHz Quad Core Snapdragon 821 CPU with Adreno 530 GPU. The rear camera is 16 MP with dual LED flash while front is a 5 MP unit. The phone uses 4400 mAh battery and comes in dual SIM configurations. The two variants on offer include 4GB/128 GB variant for 3499 Yuan (INR 34,500) and 6GB/256GB with 18k gold plated rings around camera for 3999 Yuan (INR 39,500). 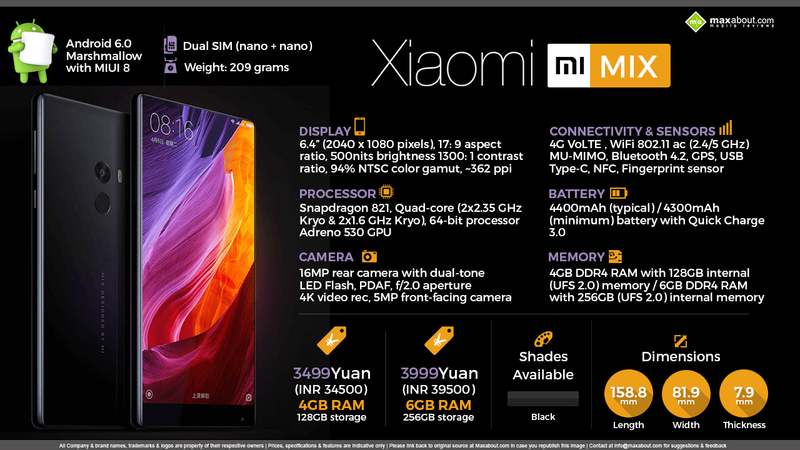 Click here to know more about Xiaomi Mi Mix.